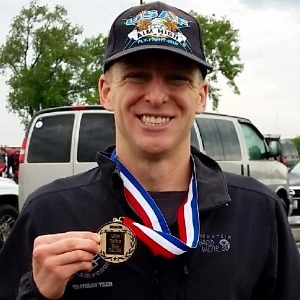 I am a United States Air Force officer and my profession is in nuclear engineering, I love working with numbers and data, and it directly correlates to my data analysis in triathlon. I am an ASCA (swimming) and USAT (triathlon) coach. My primary talents and interests lie in biomechanics, injury prevention, strength training, and constructing optimal zoning periods and peaks for racing. I am not associated with a particular company or brand, but I coach in person, online, and do video analyses. My primary background is swimming and am a ASCA Level 2 coach as well as USAT Level 1 coach. I grew up swimming when I was seven years old, soccer before that, track in high school, and triathlon in college. I've created many triathletes from swimmers, have coached a USA Swimming National Championship swimmer and multiple teams, and have introduced many runners to swimming. I have competed in five USAT National Championships, qualified for all of them since 2010, qualified for two ITU world championships, competed in the 2014 and 2017 70.3 World Championships, and just qualified for the Kona Ironman World Championship in 2018. By stating my racing and coaching accomplishments, I hope to show that I take a scientific approach and use this experience to test and evaluate training and racing ideas on myself before I advise my athletes. I started a complete beginner just like all of us once did and strove year after year to make myself the best I could be. Now that I've seen triathlon from many levels and race distances, I am confident in coaching athletes from many different backgrounds. I have no athlete requirements. A heart rate monitor and power meter are preferred if online coaching. Success. Coach Carl Eichert has been notified of your message.